Uranium ore is different from the other ores, as it requires sulfuric acid to be fed into the electric mining drill to mine it, at a rate of 10 sulfuric acid per 10 ore mined. Because of this, uranium ore cannot be mined by hand. No additional sulfuric acid is consumed when additional products are created due to a productivity bonus from productivity modules or mining productivity. For example, with a 20% productivity bonus, 12 ore will be mined for every 10 sulfuric acid consumed. 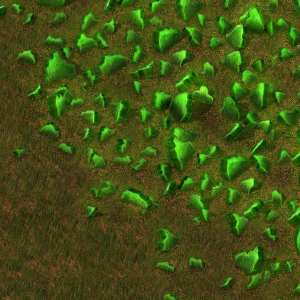 The ore has a green glow, making it easily seen at night. Electric mining drill placed on uranium ore, pipe input/output visible. 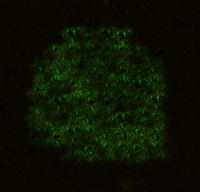 Uranium ore glows at night, making it easier to see.